I didn't go to many estate sales this week (relatively speaking), but I went 3 days in a row! 3 days of estate sales, and this was what I came home with. This week, I had some special guests join me! Always more fun with a pal, I say! I invited my brother to go to an estate sale with me that started on Wednesday because it was one street over from a house he lived in about 15 years ago, and I figured it'd be fun! Well, it wasn't a great one, but of course it was fun anyway! And I did make it home with a little jewelry. This one was on 4330 Middleton, in the Preston Hollow area. The last day is Saturday, and I bet you can get some great deals if anything's left (but I'm pretty sure it will all be junk because it already was mostly junk on Day 1) Like I said, this one started Wednesday. Oh, and the house is a tear down, so they gotta get everything out of there ASAP. Thursday, I hit a few by myself. One was on 11031 Joymeadow. It was hosted by a company called "Attics to Basements". I've gone to many of their sales, and they're pricing is clearly set for the day when everything is 50%. It's a rip off if you go on opening day before they take a big percentage off. Way over priced. I'm officially not going to their sales anymore. OFFICIALLY. However, that sale is still going on tomorrow (Saturday) and with that being the final day, maybe the prices will be more in the ballpark of fair. Maybe. But I'm done with them, and you won't hear me speak of them again. Fermin's gonna go nuts when he sees his new cufflink dish! I also bought a necklace and a gorgeous bracelet. The bracelet was for sure my treasure of the day! I mention David Turner and his wife, Martie's company on this blog often. They put on great estate sales and I always try to make it to the ones they are running. Very fair, and very nice. I also went to one at 3151 Merrell where I found an $8 Alpaca sweater. I was cold when I saw it, which explains my impulse buy. But I do like it. And it is warm. 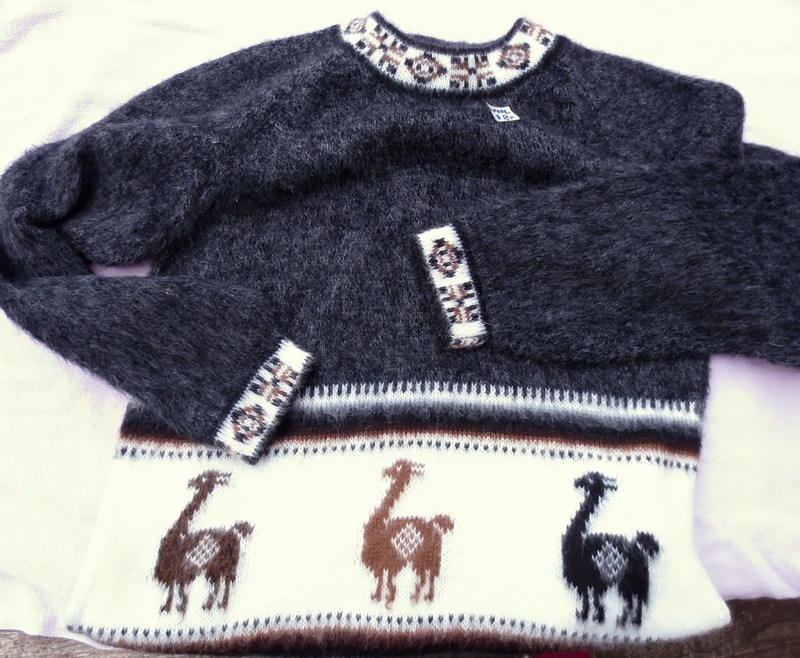 My illustrated Alpaca sweater, just in case anyone wonders what it's made of. By Friday, I didn't even plan to go to any estate sales, but I got a text early in the morning from my friend, Steve, asking me if I was going to any. So, because I'm all about doing for others, I found one for us to go to. It was interesting because it was the estate of the former personal assistant to Stanley Marcus. Loads of stuff. 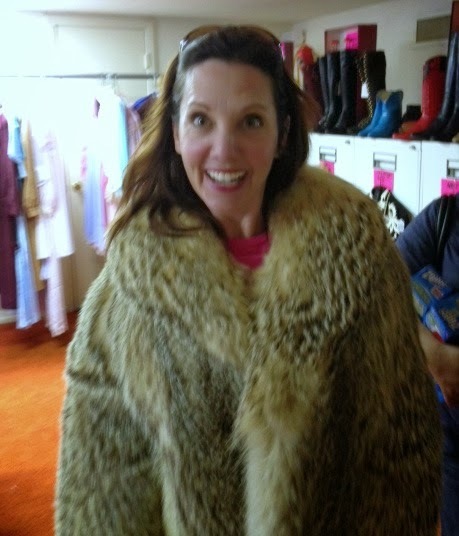 Yep, I look stupid in a fur coat! A roomful of size 6 shoes, lots of fur coats (see side photo), lots of Asian artwork, tons of collectables, the prettiest bookmarks I've ever seen (and I regret not getting one! ), lots of stuff from Neiman Marcus, (of course)-- a LOT to look at. It just started today, and tomorrow is the last day. I highly recommend checking it out! Hopefully, they will offer a discount tomorrow. It was all a little high for me today, and I left with nothing, but it was fun! So that's a wrap for this week! Happy estate sale-ing! 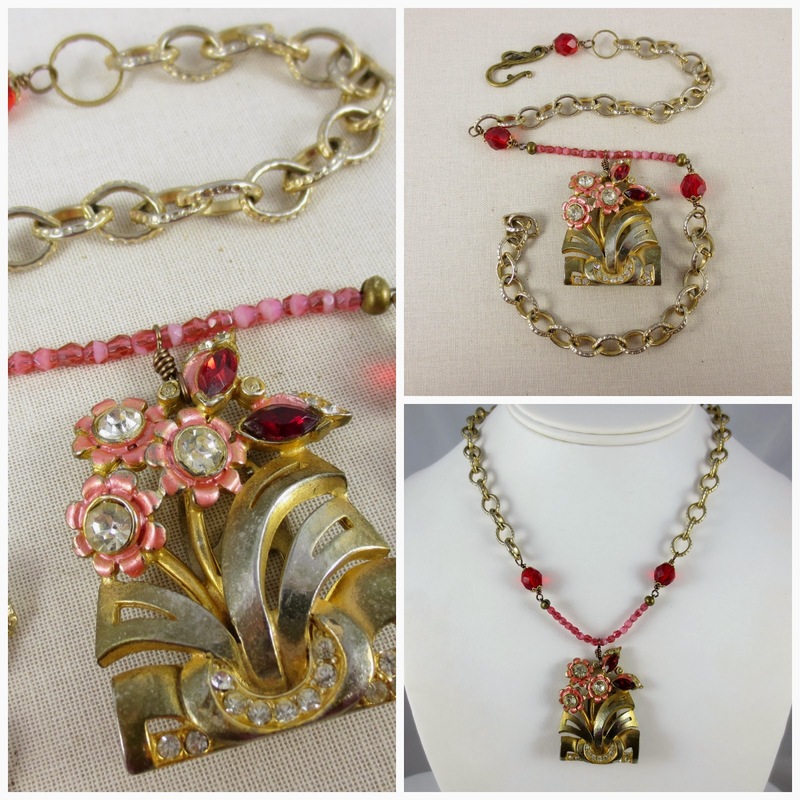 I love using vintage jewelry, and combining it with other vintage jewelry parts, and/or modern components and reassembling them into something new. Some people call what I do vintage repurposing, and sometimes it's called vintage assemblage. Either way, it's something I'm very passionate about. I've collected so much vintage jewelry over the years because whenever I see it at an estate sale, garage sale, auction I just can't pass it up! 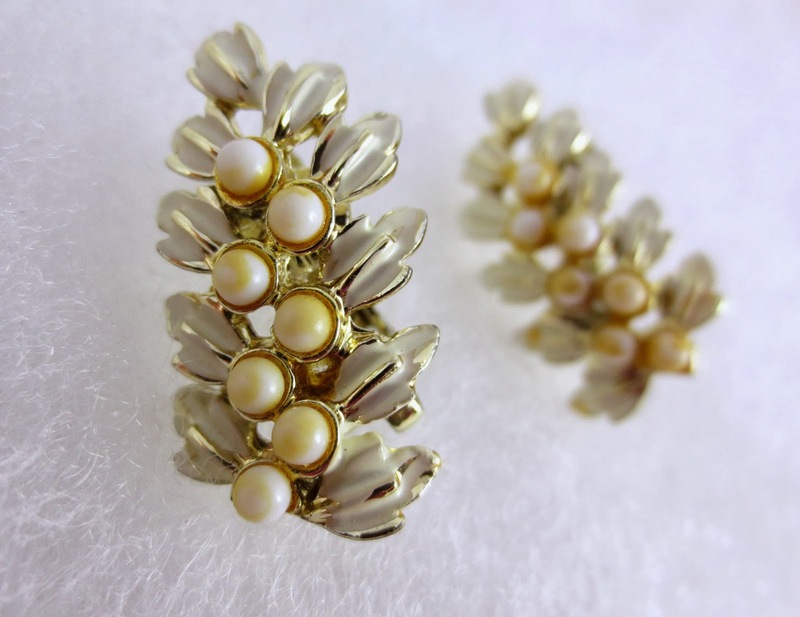 When a vintage piece of jewelry is in really good condition, I think it should usually just be left as it is. So, because of that, I occasionally sell vintage jewelry in my Etsy shop, versus my repurposed or vintage assemblage jewelry. I've just listed a few items that fall into that category. This pair of earrings is so cute. They're clip ons, which I use to think no one wears anymore. 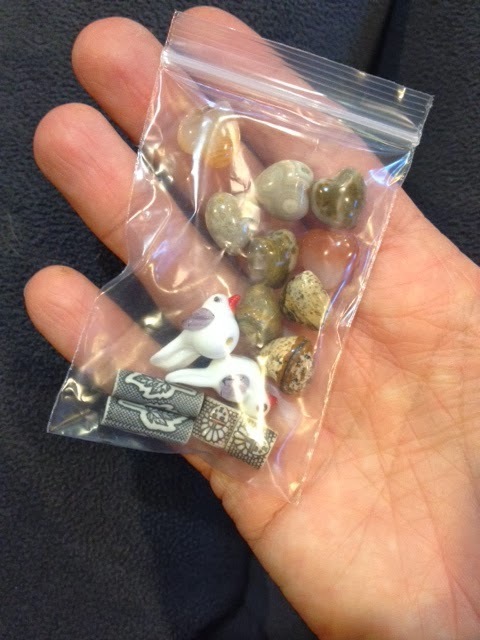 But as it turns out, sometimes things happen to the holes in our ears, and clip ons make more sense! These are dainty, and so sweet. They are CORO, a company that was established in 1901 and stopped production in 1979. 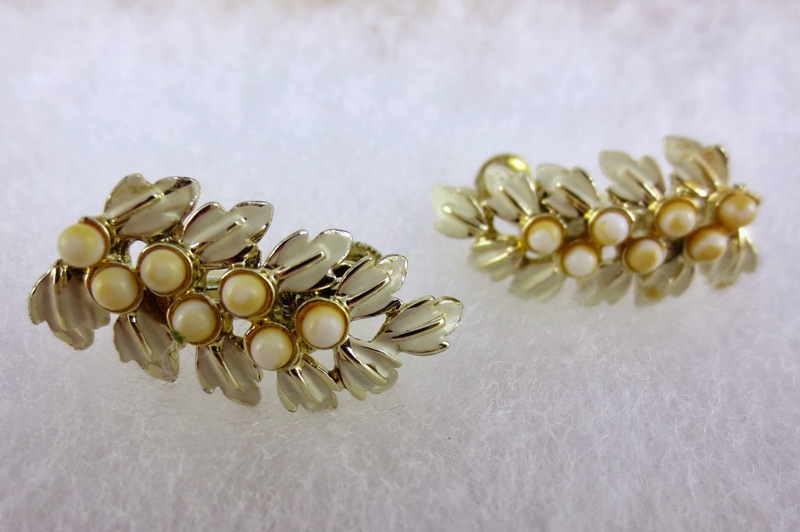 This particular pair of earrings are from the 1950s. 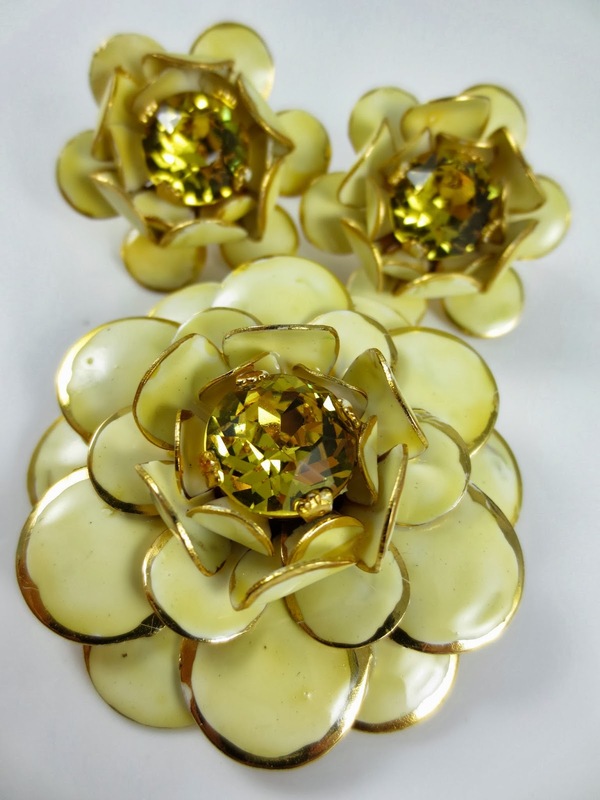 I just reduced the price of this Sandor set of a yellow enamel flower pin and matching earrings. The Sandor company began in the 1930s and ceased production in 1972. Sandor jewelry, and in particular, the Sandor enamel flowers like these, are highly collectable because they're just beautiful and look very life-like! This set is stunning, and the color is absolutely gorgeous! They'd be great for Spring! 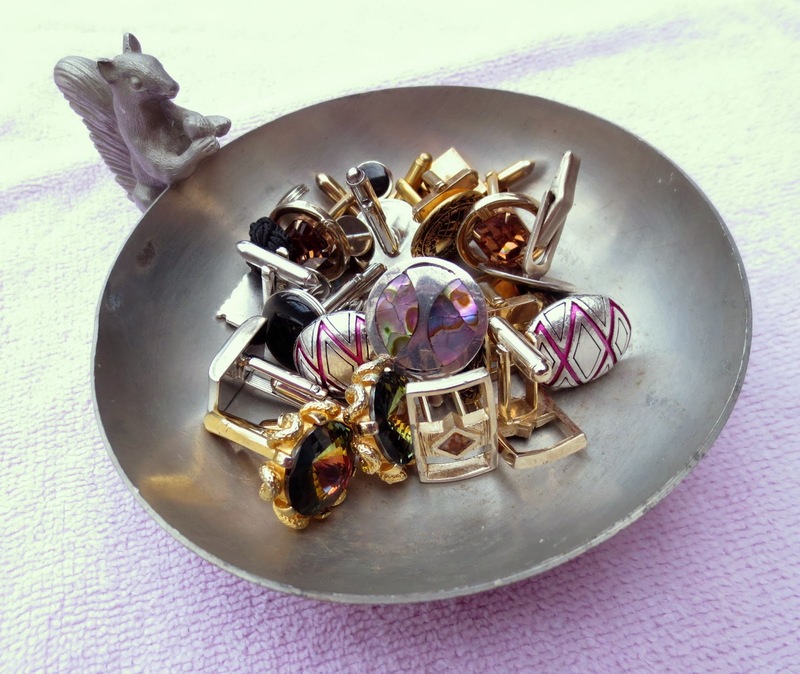 I've got a whole section in my shop labeled "vintage jewelry". Currently, there are about a dozen items listed, with lots more on the way! I've discovered that brides often peruse Etsy listings looking for their "something old" for their wedding day. I love that some of these little vintage treasures I've picked up along the way are being put to such sweet, sentimental use. 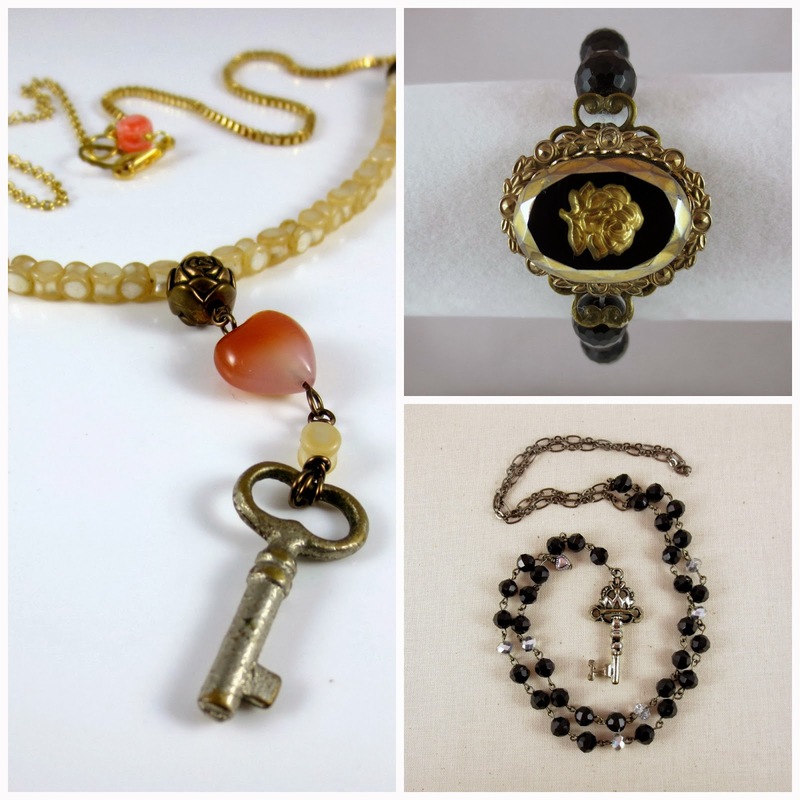 Vintage jewelry also makes great, thoughtful and unique gifts! You can find these vintage items, as well as lots of vintage assemblage in the Resparkable Vintage store over at the Etsy.com site. Last weekend, Fermin and I went and saw "Inside Llewyn Davis", which I liked. But I love the soundtrack. So, my pick for today's Music Monday is "Fare The Well". This is the version of the song I've actually heard on the radio, but there are a few versions on the CD. Also, lots of other great music. I highly recommend it, if you're into the era of 1960s singer/songwriters. I worked on this repurposed vintage assemblage necklace over the past couple of days. It just may be my favorite necklace of all time. The floral pink and red vintage shoe clip is just gorgeous and so unique. I've never seen another like it! 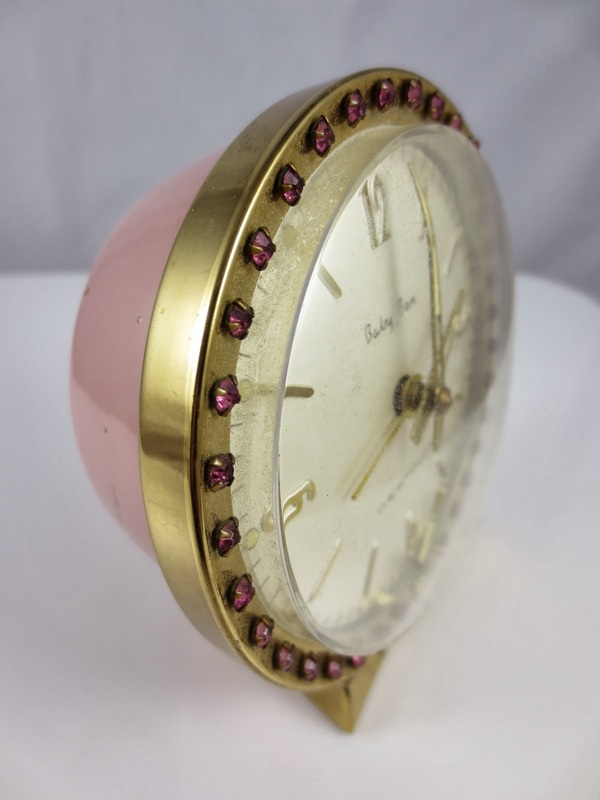 Although the antique gold has worn off a bit, as you can see in the photos, in my opinion, that only adds to the charm! All the rhinestones, including the little teeny ones along the bottom and bordering the top of the red "leaves", are still intact! STUNNING. The only "new" components to this necklace are the small pink bead strand and the lobster clasp in back. I found the chunky chain during one of my estate sale days, a friend gave me the vintage red beads, and I have some vintage bead caps I was able to use on those. I made it pretty short in length, because it just looked best when it was just at the base of the neck. I really wanted to highlight that clip, and make sure that it was in the easiest place for eyes to fall. I photographed it, because I plan to post it up in the Resparkable Vintage Etsy store. But I haven't listed it yet... I'm not sure I can stand to part with it. I know I'll never see another one like it. Not even close. I quickly, and I mean quickly! went to 3 estate sales this morning. The first, was at 6242 La Vista. It was advertised in big, bold letters as being the estate of Willetta Stellmacher. It said, "she was a ravishing beauty in her youth, a dancer at Chicago’s prestigious Edgewater Beach Hotel, the steady girlfriend of a Chicago mobster, and a lady who rubbed elbows with famous singers and bandleaders. After years traveling the country, Willetta returned to Dallas and put her business skills to work managing hundreds of apartments in Texas and California. This is the lady Whitney and his staff are paying tribute to starting this Wednesday." Tons of beautiful art, furniture, antiques and collectables. And all of it out of my price range today. If you're looking for inexpensive little knick knacks paddy wacks, this one probably isn't the one for you. But it's fun to look through everything and to see the inside of a house like this one! They were even selling some of the gorgeous chandeliers. I'm pretty sure the house is in the historical district, so hopefully it cannot and will not be bulldozed down, but instead someone will come in a restore it. I also went to one at 2105 J.J. Pearce in Richardson. The house was full of a lot of vintage 50s, 60s, and 70s furniture and decor. It was okay. Prices weren't great in general, and costume jewelry was a little over priced. Nothing for me-- boo hoo. inside view with previous price tag! I love little bowls and dishes like those. I put them on my shelves and put little trinkets in them. I also put them in the drawers and use them as cute containers for all sorts of things. It's just a pretty way to organize things. 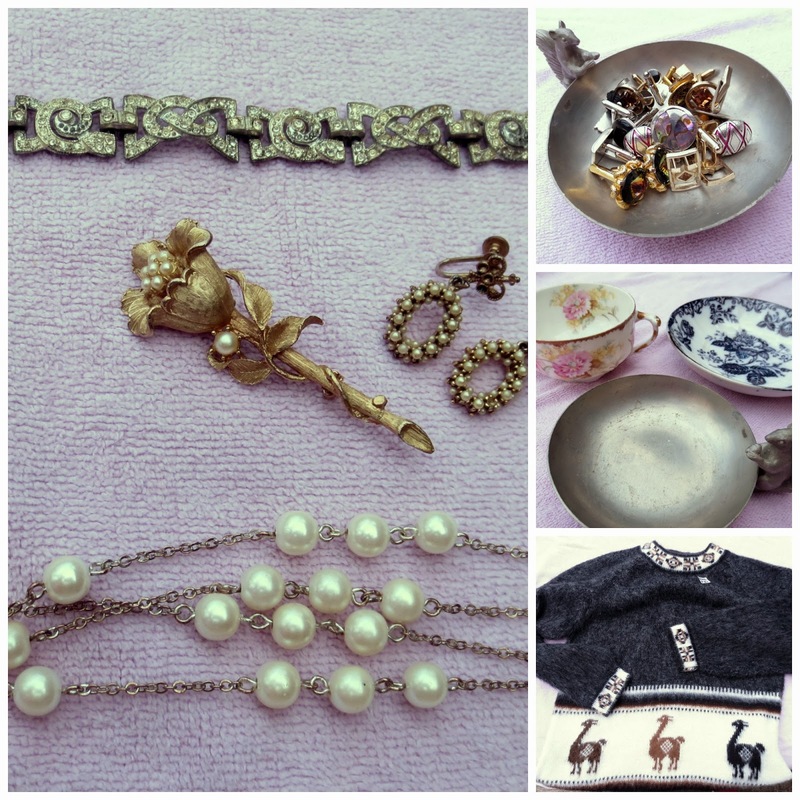 To see more, please visit my Resparkable Vintage shop! I got a huge cookbook at the library the other day, full of slow cooker recipes. 1400 recipes full! It's called Fix-It and Forget-It. I've made some yummy things over the past week or so in my crock pot, thanks to this book. I'll share some of those recipes on the blog, starting today. I only made a few minor changes, mostly to make 2-3 servings , rather than 4. I used only 10 slices of bread (wheat), 2 cups of reduced fat sharp cheddar, just a few little dabs of butter, 5 eggs, 2 cups skim milk, 1 1/2 tsp Worcestershire sauce. I reduced the salt just a little as well. I loved this recipe because it was super fast and easy, didn't require many ingredients, and could be ready to eat in as little as 4 hours, or as many as 6. I was able to fix it in about 5 minutes, put all my ingredients in the crock pot and forget about it while I went running errands and walking pups. All the while, my house was smelling better and better! Although the recipe called this a "souffle", it was a little more like a quiche. We had it for dinner, which was fine (I made a spinach salad to go with it), but it would be ideal for brunch, too! It would also be great to throw a few veggies in it, or even some diced chicken. I haven't been to many estate sales lately~ mainly, because there haven't been many, with the holidays and all. So today, I hit a couple that had a Thursday start and will run thru the weekend. The first was at 5748 Lindenshire Ln. (Dallas). It was fairly small, but plenty of stuff to look at and the prices were great. I got this vintage owl trivet for only $1. This owls nice and big. I've made the mistake in the past of buying small trivets, but they just aren't very functional. This one is not only functional, but cute-- and very wise! Whoot! Whoot! There was a table in the front room of items they hadn't yet priced. I found a few vintage pins and got them for a steal! Although I like it when things already have the price tags, I tend to get some of my best deals when I can just ask how much something is. a few vintage pins- the fancy bird totally cracks me up! After going to this estate sale where the prices where more than fair, it was such a turn off to go to the next one, because there, everything was way overpriced! And to make it even worse: no vintage jewelry. That one was on 7003 Southridge. But don't even bother until they start marking stuff down. I did however, like the house! And I think it's for sale. That's all for my field reporting out in the world of estate sales for today. There are several more tomorrow, and I have a feeling I'll make it to at least a couple. I will certainly report back here to let you know if I recommend them or not. For Christmas, Fermin gave me a cute pink down jacket and surprised me with a trip to Colorado. My first question, of course, was, "Have you made arrangements for Ricky and Lucy?" And just like the Mr. Happy-Go-Lucky that he is, he said, no, he hadn't. "You're seriously leaving us here?" But I called up a few neighbor friends, asked if they could partake in care for the pups, and they all gave an enthusiastic, "Yes!" response. Such short notice, but thank God, I've got neighbors that are friends too. One pair of neighbors were the official dog walkers. Another neighbor was the official meal time gal and was in charge of tucking them in at night. Yet another neighbor said she's stop over just to give them a little extra love. Because can the Ricardo's ever get enough love and affection?! Probably not! Still, it was hard leaving them behind... I thought I was going to cry. But I didn't. Because I knew they'd be well cared for and loved on, and that we would get to see them in less than a week. We flew into Denver, and it was 72 degrees! It was 30 degrees colder in Dallas. What the what?! And it was huge! I'm not kidding, nearly as big as our house. Which, I guess, is another way of saying that our house is not so big. :) I kept thinking we would have had plenty of room for Lucy and Ricky. They could've even had their own bath and bedroom. But it was pretty romantic, it being just the two of us. We stayed in Denver a few days, ate many great meals, and got to see the downtown area of Denver for the first time. Then it was time to drive to the mountains of Breckenridge. The temperature had already dropped in Denver by that time, and it just got colder as we approached higher elevation. i can ALWAYS find a bead shop! I've gone to Colorado many times during my life. And anytime I've gone during the winter, it was for skiing. But I have to confess: I didn't ski! The day we intended to ski ended up being very cold, and very snowy. I just couldn't talk myself in to getting excited to ski. And the cool thing is, I didn't have to! Fermin went without me, and I just shopped around in all the cute little shops in town. 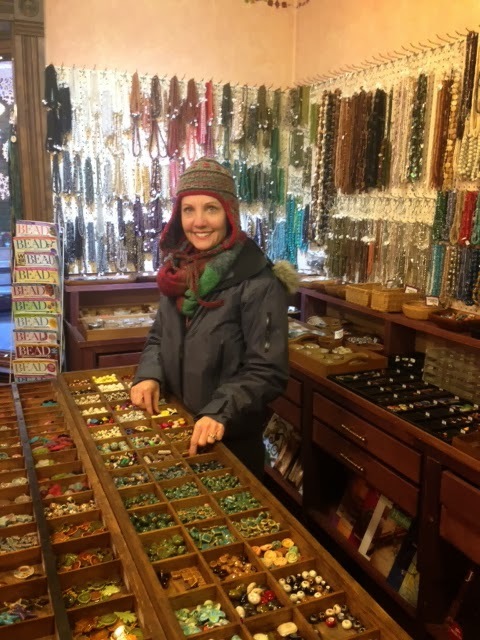 Of course, I was able to find the local bead shop! My neighbors took great care of Lucy and Ricky. And every day, I got at least one text up-to-dating me on how they were doing. 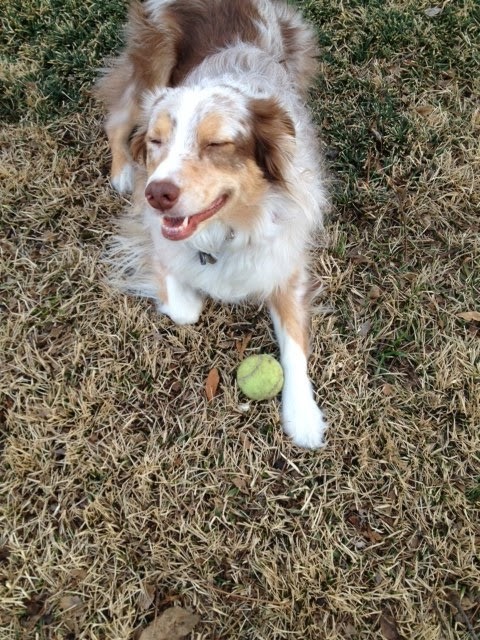 They also sent me lots of cute pictures. We had so much fun, and before we knew it, it was time to fly home. leaving on a jet plane. ok, not a jet. but yes. a plane. 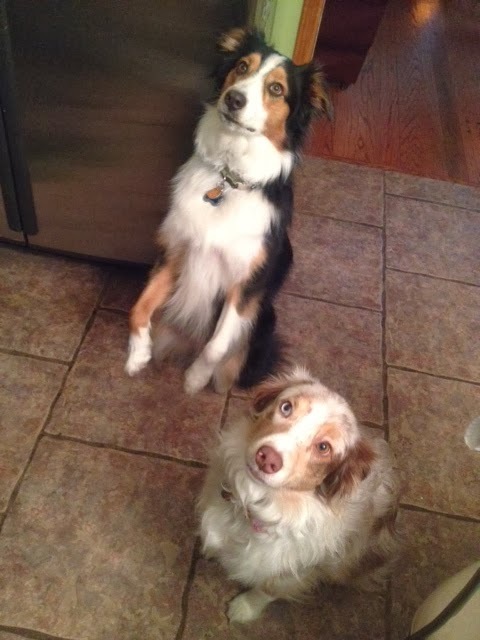 We were greeted sweetly by the pups, as I knew we would be. Lucy was so happy she cried for about 30 minutes straight. Ricky was equally as excited, but he handled himself like a man. toys and bones, scattered all over. What is with the relatively new movement of having a word for the new year, rather than good, old-fashioned resolutions? The first time I heard the idea, I thought it was sort of cool, and something I could lazily get behind. Then over the last couple of years, more and more people started talking about, and posting their word, and I decided that NO. This "One Word" movement is not for me. I set up a Twitter account. And even tweeted a few times. But only 140 characters per tweet.? Ug. And all that hash tagging and at symboling? I just can't grasp it. I'll stick with blogging. Good, old-fashioned blogging. I think I've lapsed over the last few years in actually declaring my New Year's Resolutions. But I always have goals. By writing them down, especially on my blog!, it's bound to be more encouraging than just goals (that tend to get lost) floating around in my head. So here they are...my 2014 New Year's Resolutions! Because I love to cook new recipes. Occasionally, they turn out great. And almost always, my husband tells me it turned out good, even when it didn't. The only time I hate cooking, is when I feel rushed, or realize I'm missing a necessary ingredient. Or two. This resolution, like all of mine this year, should be fun, and good for me. I just gotta be sure to plan ahead. 2. Get back to playing learning games with my dogs. 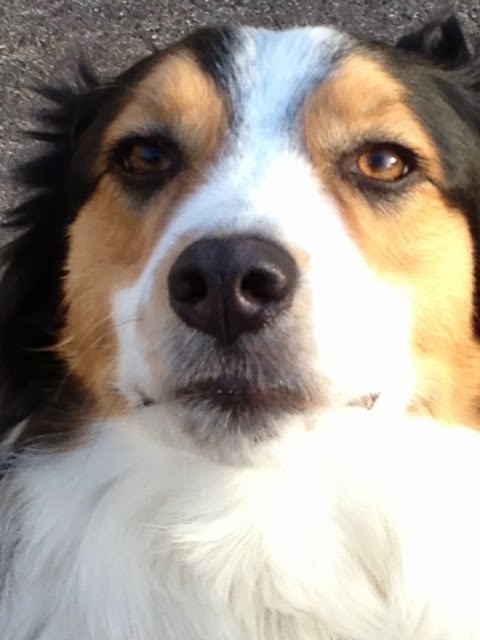 I'm currently reading Chaser: Unlocking the Genius of the Dog That Knows 1,000 Words. It's so interesting AND it's also very inspiring. There is nothing I love more than connecting with Lucy and Ricky. I know they love learning, so I wanna get back to playing fun learning games with them. I've been a little lazy this past year, but I'm stepping it up in 2014! They deserve all the time and attention I can possibly give them. 3. Work a lot more on promoting my Resparkable Vintage shop on Etsy. I think thru blogging, Instagram, Facebook, taking great photos and tagging things well, I can up the traffic and therefore put a little more of my handmade jewelry out into the world. 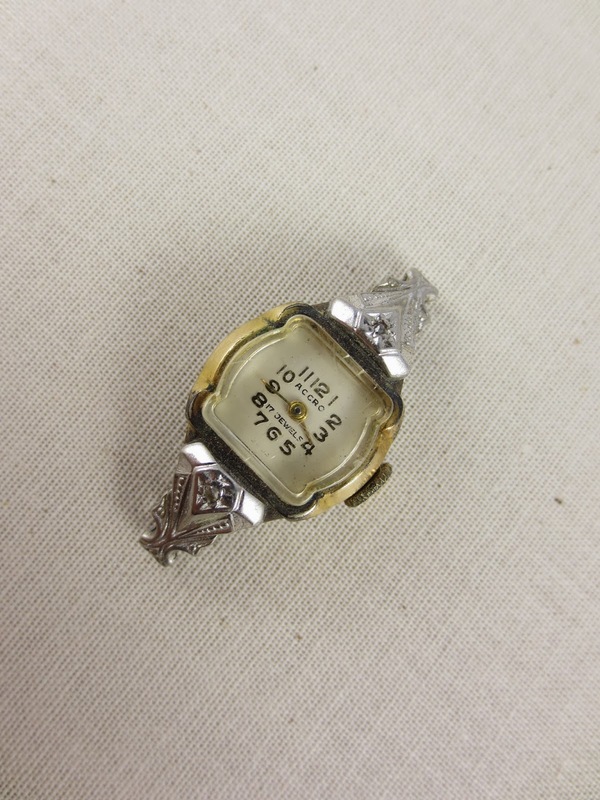 I am obsessed with vintage jewelry. I love repurposing jewelry. I don't spend enough time on the promoting side of things, but this year, I will! I love blogging, Instagram, Facebook, etc, so I'm going to remember: this is fun! All of its fun! That's it. Just those 3 resolutions. Good things come in 3s. 3 is my lucky number. And, at least for me, better than just one word.